Robert E Howard's Conan: Adventures in an Age Undreamed Of takes you into the world of Conan the Barbarian, where heroes raise blood-spattered swords against dire sorcery, exotic lands beckon to the daring danger and treasure lurks in forgotten ruins, and where loathsome creatures haunt the spaces beneath the earth... as well as in the throne-rooms of mighty kingdoms! Seek your fortune in forbidden tombs or upon blood-soaked battlefields. Cast dark and terrible spells of unimaginable power, at the price of your soul. Sail upon untamed seas to lands where no human in living memory has walked. Fight for the fate of civilization - or barbarism - on a savage frontier. Create your own legend in this decadent and violent world! Complete 2d20 game system,including combat, skills, talents, sorcery, and equipment suitable for adventuring in the age before history. An extensive gazetteer covering the whole of Conan's world: featuring fair Aquilonia, gloomy Cimmeria, magic-haunted Stygia, all the way to the far-off steaming jungles of Khitai. 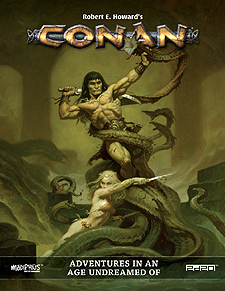 Art by a team of iconic Conan artists, including Brom, Tim Truman, Sanjulian, Eseban Maroto, Phrolian Gardner, Simon Bisley, Tomas Giorello, and more.